We set off for the scenic Danshui 淡水 as recommended by my friend SY. 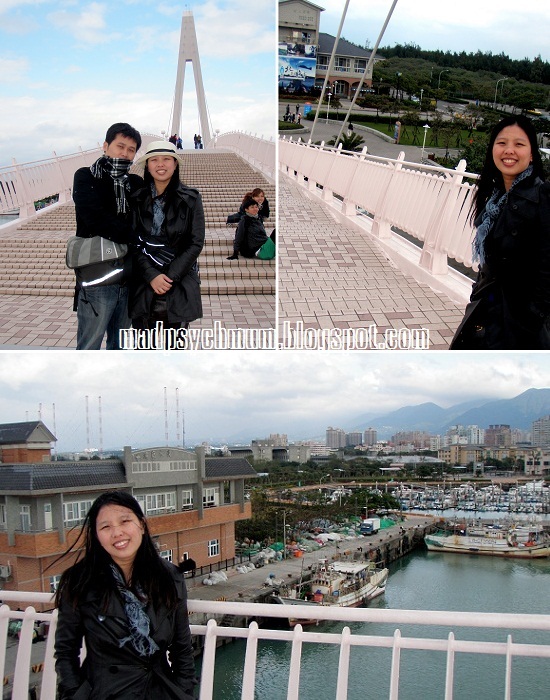 To get there, take the MRT from Taipei Main Station to Danshui Station 淡水站 on the Danshui line. Once there, you can choose to travel to the famous Fisherman’s Wharf 鱼人码头 via the Taipei County red bus 26 (NT20) or the ferry (NT50) from the Danshui Wharf 淡水码头. We decided to take the ferry, which was faster and more direct. 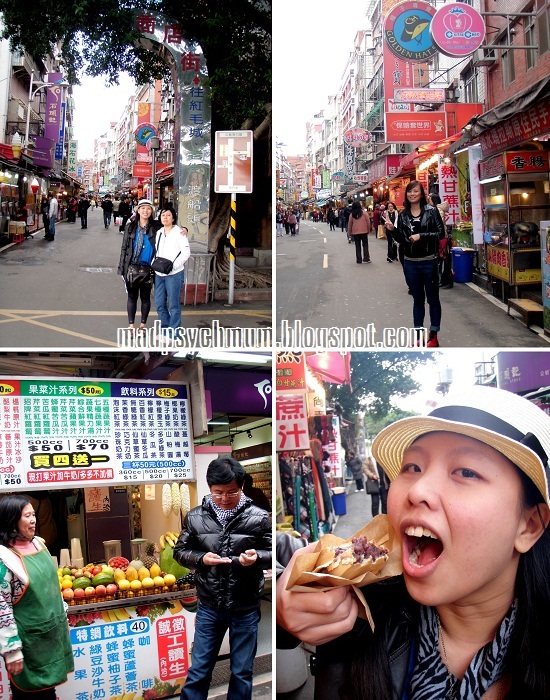 On our way to the Danshui Wharf, we passed by the Danshui Old Street 淡水老街, which was famous for its freshly made Taiwanese snacks. Apparently, Ti Hu Master was very famous in Taiwan so we ended up buying a lot of their produce home for our friends and family. We then proceeded to the board the ferry at the wharf. The ride was smooth overall until it got shaky at the end. Word of advice: sit at the front of a plane but sit at the back of a boat! As the boat approached the dock, we could see the iconic Lover’s Bridge 情人桥 in full view. I must say, I was a little disappointed that the bridge was so small. It looked so much bigger and nicer in the pictures. My dad was like, "we took a ferry all the way here to see this?" It was still very romantic and beautiful nevertheless. Finding nothing else to do around the bridge, we decided to take the ferry back to where we came from and have our lunch at a seafood restaurant on the way to Danshui Station. Apparently Jacky Wu was a customer too..
Their ﻿food was actually pretty cheap and very good! It only cost us about NT1800 for a large fish, clams, osyters, 2 plates of bamboo shellfish and 2 plates of vegetables. The hubby was ecstatic! After a sumptuous lunch, we took the train from Danshui Station to Beitou Station 北投站 where we transferred to another train bound for Xin Beitou Station 新北投站. There are other hotels with hot springs and you can assess them by taking their free shuttle services just outside the Xin Beitou Station, although you may have to wait since they only arrive once every hour. My dad was impatient as usual so we ended up taking a cab to the resort instead. 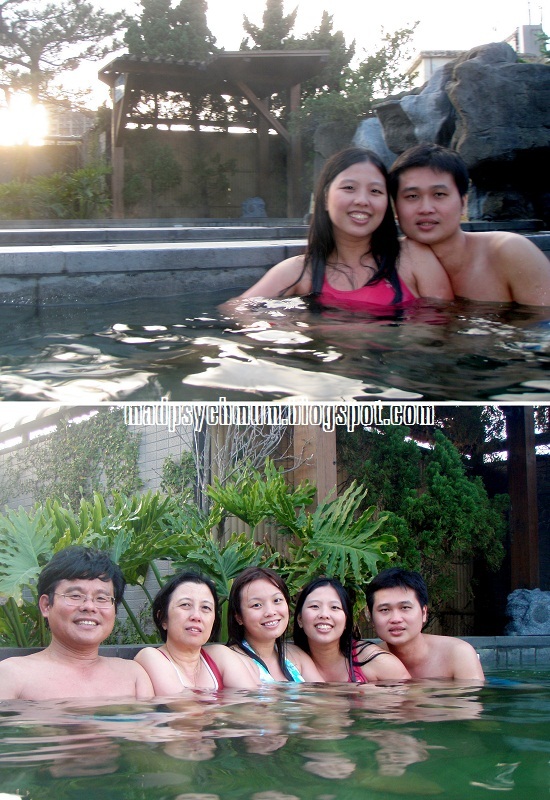 I chose the Spa Spring Resort as it was the closest to the MRT, value for money and most importantly, their hot spring pool was located on the roof of the resort so we were able to enjoy the best views of Beitou. The pool was fantastic! I think it was the highlight of our entire trip! The hot waters and cold winds were a great combination as we soaked our tiredness and frozen toes away. The hubby said that the next time we return to Taipei (which will most likely be with my baby girl and mum-in-law), we're going to stay in one of the rooms here so that we can soak in the hot springs in the comfort of our own room. After a really relaxing soak, we took the resort's shuttle bus back to Xin Beitou Station where we took a train back to our hotel. 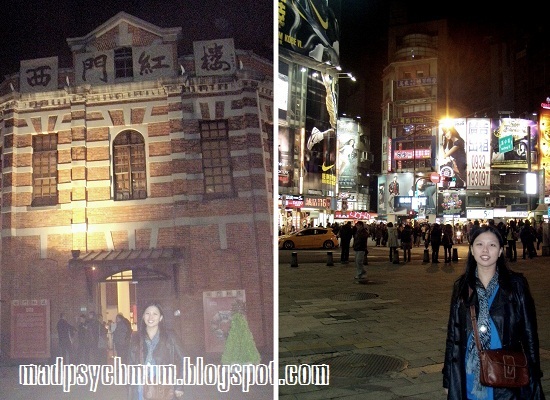 After enjoying a nice Japanese dinner, we made a final stop at Ximending again to do more shopping. I also stopped by the famous Red House Theatre for a quick snapshot. I must admit, the theatre looked really creepy at night so needless to say we didn't stay too long!